BabasChess is a new revolutionary Internet Chess Client for Windows. 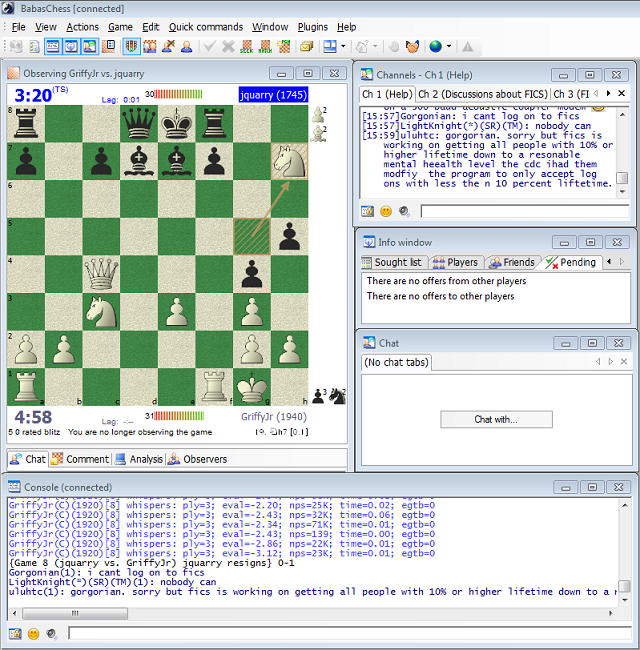 It combines ease of use with powerful features for advanced users; integrates a fast and customizable playing environment with a powerful PGN viewer/editor, chess engines support for analyzing positions and amusing chat features. BabasChess is totally free and supports many different languages: Croatian, Dutch, English, French, German, Hungarian, Italian, Polish, Portuguese, Spanish. It runs on Windows 95/98/ME/NT/2000/XP/Vista, it can also run on Linux. Download it now! Highly customizable board: vector pieces with antialias (more than ten different piece sets available) or bitmap pieces (more than 40 piece sets available with GraphicPack installed, four new enhanced bitmap piece sets with semitransparent antialiased borders to look smoothed at any size), squares (solid color or bitmaps), name and clocks colors and sizes and many other options. Customizable popup windows displayed on opponent's requests (challenges, draw offers, ...) and other events (partnership, game finished, ...). Customizable move input: drag-and-drop move or two-clicks move, with the possibility of hiding the piece being dragged. In order to install BabasChess, download the main setup file for your Windows version and double-click on it.Windows 95/98/Me users: it is recommended you download the setup file into a folder witha "short" pathname, such as "C:\temp". Use the same procedure to install additional components. The setup files require Windows Installer: if you get an error while installing BabasChess, go to http://windowsupdate.microsoft.com and install the latest version ofthe Windows Installer. A plugin is a software module that extends BabasChess, adding new features. Use the "Plugins" menu in BabasChess to install, uninstall and configure plugins. This small plugin adds text-to-speech capabilities to BabasChess. If you are not using Windows XP and the plugin does not work,you probably need to install the Microsoft Speech API 5 [6.5Mb]). A plugin to allow a better interaction with ChannelBot on FICS. This plugin adds a new tab to the Info Window, which shows a graph with your ratings. The graph is updated each time you finish a game (you need to play at least two games after installing the plugin to see something in the graph). Note: BabasChes v3.9 or higher is required. A plugin, developed by Bob Croucher, to print PGN games from BabasChess. The source code is available here. This sections contains external software tools that can be useful to BabasChess users. This simple utility developed by Pirov can be used to convert crazyhouse PGN files saved by BabasChess into BPGN files to be used with programs like BPGNView. Microsoft Excel is required to run the tool. In case you are not able to run Windows Installer setups on your PC (e.g. if you do nothave administrative rights), you can download one of the following zip files, unzip itand manually create a link to the main executable in your start menu and/oryour desktop. If you are a programmer and want to create plugins for BabasChess, you can download the plugin SDK here. The SDK includes the C++ header file required to create BabasChess plugins and the source code of some plugins. FICS is down for a few days time the owner returned from vacation and made the repairs. I confess that, to make this page on BabasChess when FICS (freechess.org) is turned off, is not smart.